In the southern part of Peru, there are the lush valleys and gorges between, it is all dry elevated plains and is covered in a small dark red surface stone that is polished by the desert winds. In this dry land where it rained only once in a few years lived the Nazca people some 1500 to 2000 years ago. They became famous because of their geological climatic features and with very famous Nazca lines. These Nazca lines are different figures created on the vast dry land; the larger figures of this line are around 370 m long. The figures are a mixture of a complex geometric figure or straight lines and shapes. Around 100 figures are depicted in the straight lines and 70 or more are zoomorphic figures like birds, fish, llamas, jaguars and monkeys. This line as designated as a UNESCO World Heritage Site in 1994. These designs are made in the ground by removing naturally occurring reddish pebbles and uncovering the whitish/ greyish ground beneath. These lines can only be seen by the aircraft, they also visible from the surrounding foothills and other high locations. Till today it is unknown how they made these huge figures, what kind of technique they used! 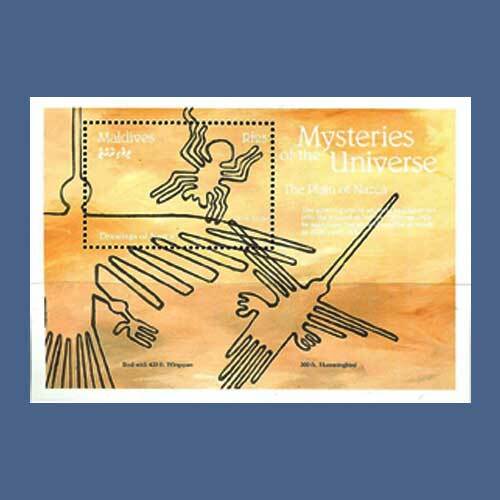 Maldives Post issued a stamp illustrating the zoomorphic; this stamp is the part of the mystery series.